Hard to believe, but 2014 is the 30th anniversary of Ghostbusters. 1984 was a magical summer for me. Indiana Jones and the Temple of Doom, The Karate Kid and The Last Starfighter were all movies I saw that year. And that June 8th weekend was a historic one because it not only marked the debut of Ivan Reitman’s comedy classic, but of also another big hit. Gremlins was in fact THE major release that weekend. It was opening in many more theaters and it was executive produced by Steven Spielberg who was red hot from directing E.T. : The Extra-Terrestrial two years prior. Even Beat Street, now a little remembered music drama about a newly emerging dance style called breakdancing, was launched in more theaters. Despite debuting on fewer screens, the picture would ultimately become the 2nd highest grossing film of the year. Beverly Hills Cop, opening at the end of the year, would be #1. It wasn’t easy to find. My local cinema that only charged $2 wasn’t showing it, but me and my buddies desperately wanted to see it. I was too young to drive so we had to beg my friend’s mom to take us so we could make the trip out of town. $5 for a matinee which in 1984 was outrageously expensive. That would be like $12 today. Unbelievable! I can remember sitting in that darkened theater wide eyed at the special effects, laughing at the gut-busting one-liners. I was captivated by what I saw and it immediately became a treasured favorite. I still cite it any time I’m asked to list my top movies. I’ll admit my love is influenced by nostalgia, but I find it has lost none of its luster. The plot is secondary to the fun, but I’ll recount it anyway. There’s this high rise apartment building in New York at 55 Central Park West, see. It’s being haunted by a demonic spirit named Zuul which starts terrorizing poor musician Dana Barrett (Sigourney Weaver) in her kitchen. Meanwhile compatible demi-god Vinz Clortho the Keymaster attacks nerdy accountant Louis Tully (Rick Moranis) at a party he’s throwing for his clients. Both beings act as loyal minions preparing the way for Gozer the Gozerian, a Sumerian god of destruction who can manifest itself in different forms. 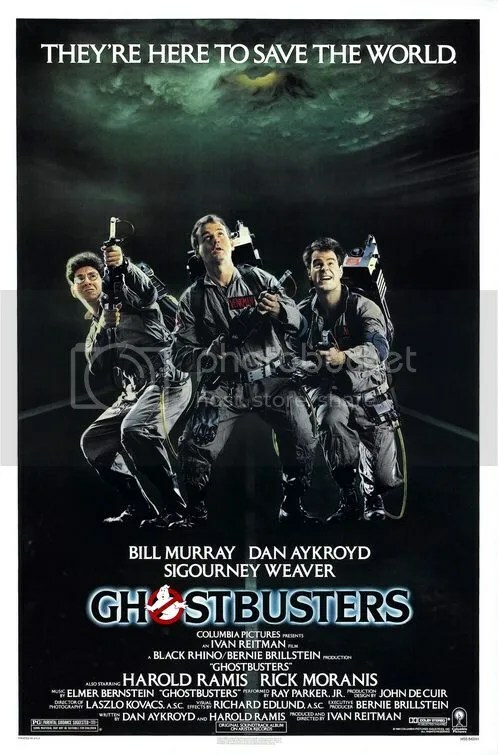 Scientists Peter Venkman, Ray Stantz and Egon Spengler are doctors of parapsychology. With paranormal activity in New York on the rise, they create The Ghostbusters, an exterminating business of sorts. Ghostbusters is quite simply one of my most beloved films of all time. The iconic production is a perfect marriage of a special effects extravaganza with spectacular performances to create one side-splitting gem. Bill Murray is the undeniable star and he’s in top form as Dr. Peter Venkman a sly, laid back scientist with deadpan delivery that seems more concerned with dating his pretty client Dana Barrett than actually getting to the bottom of her disturbances. Sigourney Weaver nicely straddles the line between exasperated annoyance and charmed love interest. Bill Murray likewise has great camaraderie with his fellow Ghostbusters Dr. Ray Stantz (Dan Aykroyd) and Dr. Egon Spengler (Harold Ramis). Those two are also responsible for writing the finely tuned screenplay. It zips, it pops and it never lets up. Ernie Hudson joins them later as Winston Zeddemore. He delivers my favorite quip after the group is blown away by the lightening bolts of an evil entity from another dimension. There is a slew of funny dialogue and Rick Moranis’ nerdy portrayal of Louis Tully delivers a lot of it. He‘s hilarious. “Okay, who brought the dog?” he grins after hearing the growl from the long horned beast hiding in his closet. The spectacular special effects support the story, but they never threaten to overshadow the actors. The technology was state of the art at the time, even earning an Academy Award nomination. But it lost to the mine cart scene in Indiana Jones and the Temple of Doom. Perhaps time has rendered the optics a bit quaint to a modern audience. The sight of that devil dog leaping from the closet and running around the city is the most dicey. But it’s the comedic interactions between characters that hold our focus, not the whiz bang appeal of the visual displays. Ok so there’s that “monster” near the end that dwarfs everything else. When the Destructor of their choosing threatens the city and their very existence, it’s memorable. That’s the kind of silly moment of brilliance that makes you realize you’re watching a work of creative genius. Oh yeah. I adore this film. In all the world, no city was more impressive than Metropolis – an exaltation of buildings towering into the skies. A city to be idolized and adored where people seemed free to concentrate on pleasurable pursuits. But beneath the surface lay the reason why Metropolis thrived. As happy as life was above the surface, so was the sadness of the workers beneath the city’s shiny exterior. Working long days deep below without daylight or fresh air, it was a dismal existence consumed by backbreaking labor. Joh Fredersen, the city’s founder and architect, observed all from on high with a watchful eye. His son Freder lives among the carefree unaware of the horrors underneath. Then one day Freder encounters the beautiful Maria, a woman who takes care of the worker’s children while they toil. He is immediately smitten by her and trails her to learn more about the woman. He soon becomes aware of the ugly side of Metropolis. Horrified by the drudgery of the troubled lives of the working class he vows to become an agent for change. Giorgio Moroder Presents Metropolis is a marvelous reinterpretation of an incredible film. Fritz Lang’s Metropolis is an important work and synth wizard Giorgio Moroder complements Fritz Lang‘s artistic vision. Metropolis was a silent first released in 1927. It had an orchestral musical arrangement by Gottfried Huppertz which included elements from the music of Richard Wagner and Richard Strauss. In 1984 Giorgio Moroder took the Metropolis print, composed a new more modern score, added sound effects, and color tinted certain scenes. The Giorgio Moroder entry was actually shorter than existing prints at the time. This was due mainly to the addition of subtitles to replace intertitles that displayed dialogue and running at a quicker 24 frames/second. This version was a restoration of sorts for the time, but it’s also HIS vision. Highly controversial when it was released back in 1984, this strongly divided audiences. I can imagine that to purists, taking a respected work of art and applying such changes is something akin to blasphemy. I, however, am not one those people. Obviously the concept isn’t meant to replace the original Metropolis, which still exists in all its glory, but it is a revitalization of the silent classic. In fact, Moroder’s undertaking was key in stoking renewed interest in the seminal work. 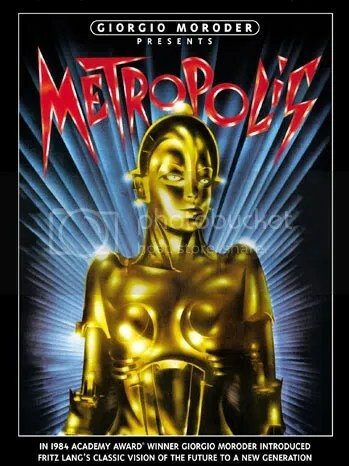 In 2010 the most compete version of Metropolis was discovered totaling 147 minutes. I recommend seeking that as well as it approximates Fritz Lang’s work as it was originally presented. Moroder’s synth driven score gives the action on screen a vitality and energy not present in the original. Being a silent with all of the print and sound quality issues that go along with it, the application of contemporary music with color tints doesn’t seem so abhorrent. It provides a modern context to a picture already visually ahead of its time. Although mostly an instrumental creation, he also included several pop songs written for the movie by the likes of Freddie Mercury, Bonnie Tyler and Pat Benatar. The lyrics of these songs inform the storyline so they don’t just feel like throwaway numbers. The pop rock compositions revitalize the original. Much like a remix of a classic song, they energize the narrative and make it more cohesive and urgent. Every spectacle pulses with a renewed vitality. The disco number that plays over Maria’s striptease only emphasizes the seductive nature of the dance. The adaptation succeeds because Giorgio Moroder has an obvious love for the material. Scene after scene fascinates with mind-blowing displays that have never been equaled in style or design. Metropolis is among the most visually notable triumphs ever. Quite a feat considering it was released in 1927. The architecture of the city is a combination of contemporary Modernism and Art Deco. Even by today’s standards these images continue to impress. When a enormous machine explodes killing dozens of workers, Freder imagines it as a monstrous deity to which the laborers are sacrificed. Stunning visions of the Tower of Babel, based on a painting by Pieter Bruegel , are mesmerizing. And perhaps most iconic of all, the astonishing moment in which scientist Rotwang transforms a robot into a double of Maria using her soul. The segment is technologically dazzling manifestation of light and electricity. The undulating Saturn-like rings pulsate around the metal creation complete with futuristic sound effects. Metropolis remains the most expensive silent film ever made and it shows. Metropolis is a fundamental work in science fiction. True, the melodramatic acting of silent films can come across as unintentionally comedic. And the parable of class warfare is about as timeworn an idea as they come. At one point, Maria implores “There can be no understanding between the hand and the brain unless the heart acts as mediator.” That sounds like the wisdom from a fortune cookie, but along with those overworked ideas, beats Fritz Lang’s vision of a ultramodern city that continues to influence filmmakers of today. Star Wars, Blade Runner, The Fifth Element all gather inspiration from Metropolis. Even the video for Madonna’s “Express Yourself” relies heavily on the masterpiece. Giorgio Moroder’s reinterpretation only accentuates Fritz Lang’s imaginative talent. At times it’s ridiculously over the top, but that’s what makes the story so endlessly watchable. It stands up to repeated viewings. Giorgio Moroder Presents Metropolis is a revitalized adaptation of a classic film and deserves a hallowed place along side the original. When great special effects meet brilliant writing you get this classic 80s comedy. Bill Murray is at the top of his game here with deadpan delivery so funny, it’s just barely upstaged by Mr. Stay Puft. 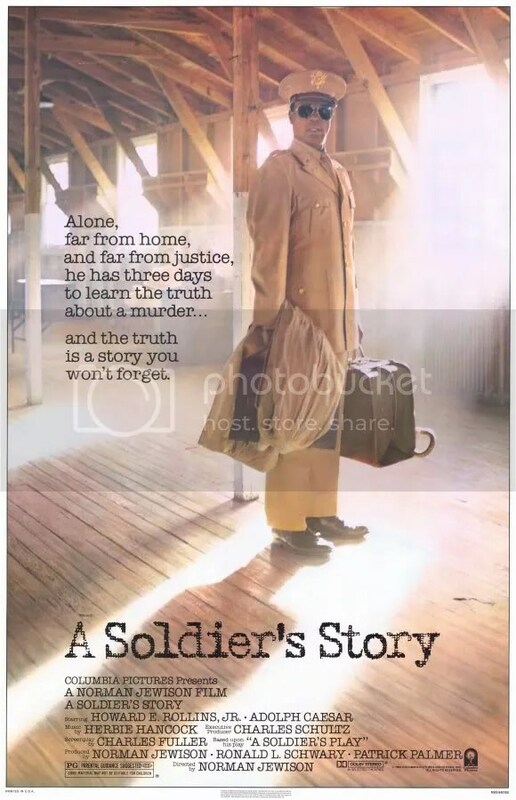 Courtroom drama, written by Charles Fuller from his Pulitzer Prize-winning, “A Soldier’s Play”, was nominated for Best Picture. Great ensemble cast features early supporting performances from Denzel Washington, David Alan Grier, and Robert Townsend.